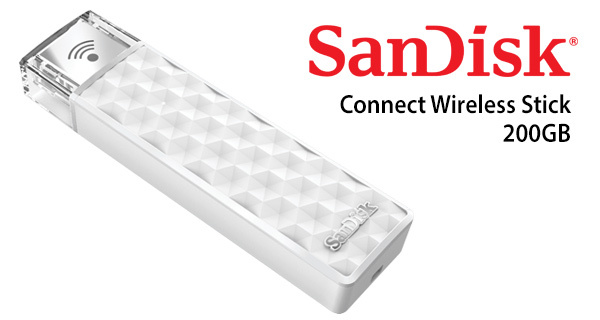 SanDisk has announced a new model of its popular Connect Wireless Stick drive, which now comes in with a whopping 200GB of external storage for iOS and Android devices. The announcement of this new arrival was made by the company at the CES 2016 in Las Vegas, and unlike most products being showcased at the show, this particular contraption can be purchased right now. With the explosion of content, people need more advanced storage solutions to keep up with the volume and quality of the photos, videos and files they’re creating on their mobile devices. Our goal is to deliver innovative, intuitive offerings that help them capture life’s great moments without worrying about storage limitations. For the uninitiated, the Connect Wireless Stick is the simplest way to expand storage on your mobile devices, particularly on the iPhone and iPad which comes with a fixed storage capacity. So the next time you feel short of storage space on your say, 16GB iPhone, you can simply throw in data into the Connect Wireless Stick, and pick it up wirelessly on your iPhone through the dedicated SanDisk Connect app. SanDisk’s 200GB Connect Wireless Stick has been recognized by CEA at CES 2016 as an “Innovation Honoree” in the wireless handset accessories category, which in itself is quite an achievement. The Stick is available to purchase right now for $119.99, which is quite the steal considering the older 128GB model is still retailing for $99.99. Rather upgrade from 128gb iPhone to the upcoming 256gb iPhone.